To increase sustainable sporting participation and facilitate guiding children towards a healthy and fun life. Our experience has developed from over ten years of PE teaching and sports development in Primary and Secondary schools in Kent. We believe that sustainable physical activity and sport can be achieved not only by what we do, but equally as important is how we go about doing it. As well as delivery we focus on Teacher, Teaching Assistant and school support as well as pupil leadership to achieve this. Pupil development: we focus on Skills for Life to enable pupils to develop skills for later life. Our mission is to increase the quality and participation of sport on offer in schools and to local communities in South East Kent. Everyone can enjoy playing sport and thrive at it; Primary Sports Giants mission is to find the right sport for each participant. 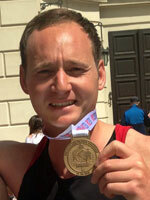 Tom brings to the team over ten years of sports development and PE teaching experience. He has gained experience in Private, Grammar, Comprehensive, and Special Educational Needs in both secondary and primary schools. In his free time Tom has established Canterbury Touch which is a very successful club which focuses on a well-rounded approach of development of players. Adding to this eight years of playing Touch Rugby, eight of those at an elite level representing England in four European Championships and one World Cup. Tom is a firm believer in allowing participants to experience and enjoy all sports on offer and uses his experience to know when to progress participants on to higher levels once they have shown physical and mental attributes that are needed to perform and enjoy more competitive experiences. He proved this in a pilot scheme he established in developing eight junior Touch players who now represent England. This has been used in various case studies due to its success! Ali has seven years of PE teaching experience including an array of coaching qualifications and experience. He started off developing his Footballing experience and has now moved his efforts to the different forms of Rugby such as contact, Touch and Tag. He also leads Duke of Edinburgh expeditions and has a great love of the outdoors. Ali is a very enthusiastic and well organised coach, aiming to motivate others not just to participate but to develop their skills to the highest standard possible. Ali is the Tiger of the team with boundless energy and an endless repertoire of puns and terrible jokes! He is an experienced PE teacher with a passion for outdoor education; he proactively promotes and assists in the running the Duke of Edinburgh programme as well as organising annual overseas ski and adventure trips. In 2018 his under 16s football team reached the final of the Kent Cup – a feat never achieved in the school’s 50 year history. Ali is a committed Canterbury Touch player and volunteer committee member. In 2016 he completed his intermediate Touch coaching certificate. He has since became the lead Canterbury Touch juniors coach where numerous players have represented the South East regional and Junior England squads. With excellent knowledge in a wide variety of sports from Archery to Football there are not many sports Ali will not know how to play. Ali has many adventurous experiences such as coaching in South America to travelling all over Europe with school trips. Vaughn comes from a well known sporting family. In his school years he specialised in Rugby and Athletics, playing Rugby to County and National 2 level and representing County in Athletics. Coaching has been a part of his life since leaving school. He was head hunted by the Science College Colombo in Sri Lanka to become Director of Rugby. His time there was very successful and the school excelled in their rugby prowess. He then moved to Scotland to play Rugby and became a Youth Development Officer. In 2014 he moved back to the South of England where he plays an active role in coaching and playing contact and Touch Rugby. He worked hard and was selected to join the England Touch Men’s Open team, recently returning home from Jersey as a European Champion. He currently plays for England in the Men’s Open and alongside this he coaches at a high level with the Southern England Youth Touch team, the Southern Mavericks. He has been a Lead Coach for Primary Sports Giants since 2016. Coaching in several schools and taking an active role in sports development for all ages outside of schools. Stuart is an enthusiastic member of the team, with a strong link to rugby, playing 13 years of union and four years of Touch Rugby. In those 13 years he has represented his home city, school, university 1st team and is currently in the U20s squad for Middlesex rugby. In the four years of playing Touch he has competed at national level and represented his country at junior level. Stuart looks to incorporate all people into sport and believes everyone should enjoy their own personal experience of sport. He strives to improve sporting levels at the same time, using a fun but structured base to his coaching approach. This can be seen from the help he has committed to Canterbury Touch and their successes as well as the coaching he has delivered at Canterbury RFC. Stuart has achieved a great deal from paying sport and is eager to allow others in the community to do the same. Charlie is an enthusiastic coach with the mindset that children must have fun in sport whilst being able to develop as players and develop valuable life skills such as integrity, honesty, trust and most importantly friendship. These are all attributes that Charlie has learnt in his experience as a player and coach. Charlie has been playing Touch rugby for six years and since then he has competed in a national under 18 side (Southern Mavericks) and been selected for the England Under 18 Boys Training Squad. As well as playing Charlie has been key in the development of many Canterbury Touch players, having managed, run and played in a national competing side (Canterbury Cubs) which were placed 5th in the whole of England in their first year of playing in the Development Touch Series (DTS). After this Charlie went on to coach Canterbury Touch’s first under 15 side and is currently developing them as players and members of society. Charlie now has been selected to sit on the board of directors at England Touch Association and has been asked to run the DTS, a national tournament. As well as Touch Charlie played rugby union for ten years and captained the local side for two consecutive years, culminating in winning the East Kent Cup. Due to this and Charlie’s general involvement in sport he won the commitment to sport award for the whole of the South East of England. He was also awarded the runner up prize by Kent Rugby for the junior volunteer award last year for all of the time and commitment he has put back into the sport. Dan the youngest member of our team has come through the ranks from a grass roots social player to achieving elite recognition representing his country in the Junior Touch Championships. Dan has been developing his coaching throughout his involvement in Touch Rugby and was one of the youngest coaches to gain his Level 2 certificate in England. 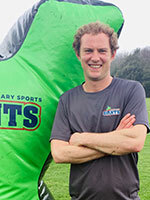 At the age of 17 Dan has managed to set up and run a successful Seniors (Aged 30+) Touch Rugby club however now wants to continue developing his skills in other sports such as Gymnastics, Football and Outdoor Adventurous Activity to enable Sports Giants participants a greater range in sports. As a coach he brings huge amounts of enthusiasm and commitment to his coaching and feels a real joy in developing children’s ability in sport and encouraging all to lead an active healthy lifestyle. When Tom first joined the England Men’s Open team he soon found out that grassroots to elite coaching and player progression in England was lacking in diversity, with 80% of the England team originating from Australia or New Zealand. He felt he could use his experience from his career to make his mark on bringing England players through the ranks. He set himself a pilot scheme in his local city Canterbury to talent spot and develop junior players, with the aim of moving them through the ranks; the final goal being to represent England in adult teams. This proved to be very successful and currently a total of seven junior players have progressed on to represent at an Elite level, three of whom are in the Men’s Open team. Tom also sees a great future in the game and aims to develop schools, teachers and junior players so they can enjoy Touch and develop to their full potential. In 2016 Tom set up the inaugural England National Schools Touch tournament which will path the way for many more schools competing in inter school Touch competitions.